To RAID or not to RAID: that is the question. If Shakespeare was born in the last 50 years and Hamlet had a computer, this would be opening of Act 3 Scene 1 of the play. With the continual price decrease of solid state drives, if you want to maximize performance of your computer, is one SSD enough to keep a smile on your face, or is two necessary to take performance up to a whole different level? We fired up a couple of Kingston SSDNow V+200 120GB SSDs -- a typical SandForce SF-2281 drive with Intel 29F64G08ACME3 asynchronous NAND flash memory -- along with our standard array of benchmarks to dig for the details. Read on to see what we have found! First up are the sequential read tests. To simply the results, I plugged them all into the same Excel graph, rather than using the stock charts generated by the respective benchmarks. 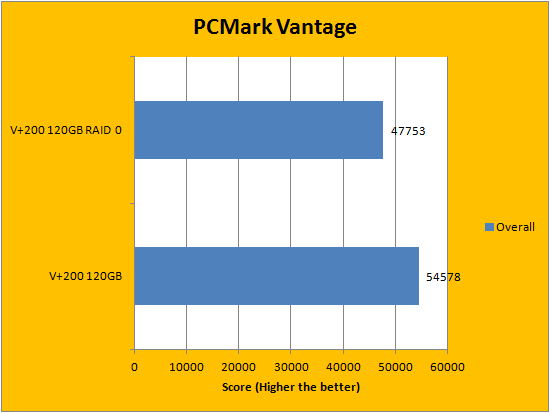 While HD Tach and HD Tune did not post significant gains in older synthetic "drag race" type tests (Unlike having two HDDs in RAID 0), AIDA64's results almost doubled, as shown in our graph above. 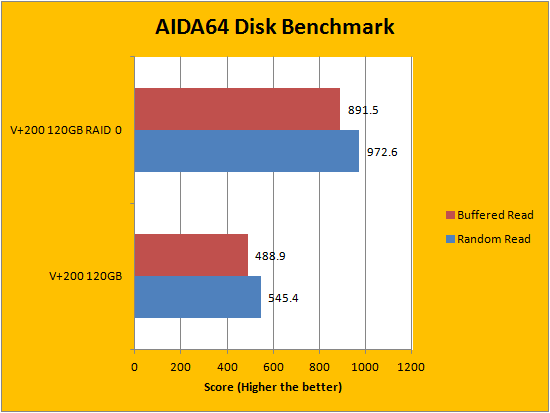 Continuing on with our synthetic AIDA64 Disk Benchmark, having two SandForce SF-2281 based drives in RAID 0 continued to post significant performance gains. Latency also halved from 0.14ms to 0.07ms, however, I left them out of the plot for simplicity reasons. Following up next is our usual ATTO read and write tests. 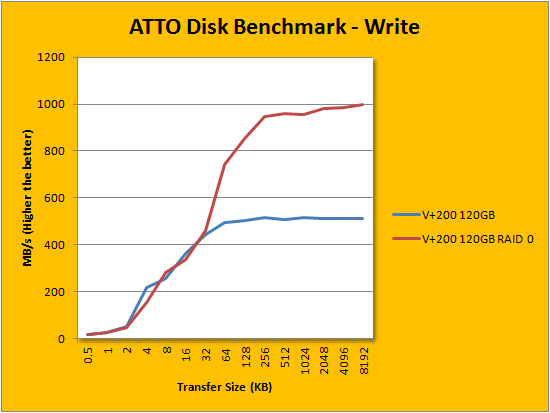 ATTO is an often quoted benchmark because it is easy to use and accurate. For the most part, it is a favorite among reviewers, and I've grown to embrace it as much as the next for the last little while. 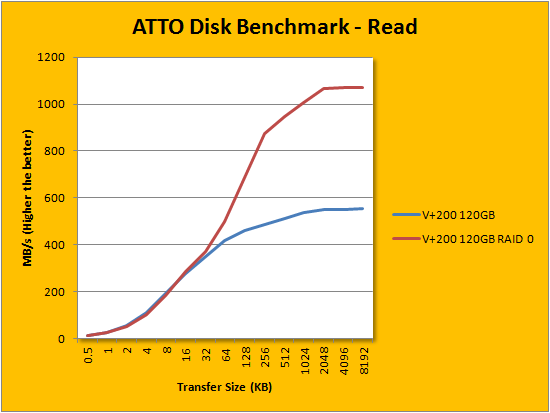 ATTO uses easily compressible data, so SandForce based SSDs will perform very well here. Generally speaking, performance was almost identical on the curve until it reaches the 32KB mark; where having two drives in RAID 0 really pulled away from the lone SSD setup. At 999.1MB/s peak write and 1068.3MB/s peak read -- you've read that right, over one gigabyte per second -- the RAID 0 results are simply phenomenal. That's not saying the single disk's 552.8MB/s read and 514.7MB/s write is bad by a long shot, but the numbers are the numbers. 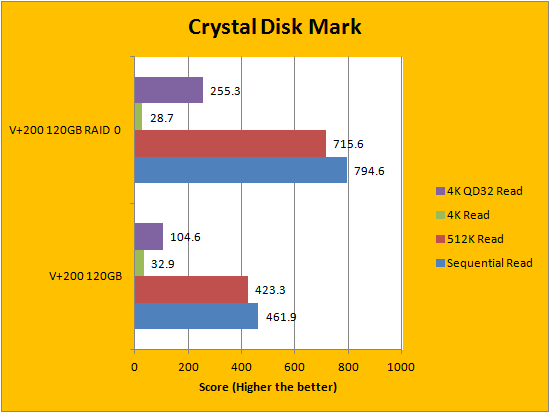 Again, when it comes to having a pair of these drives in RAID 0, there is not much question that the paired SSDNow V+200 absolutely destroyed the single V+200 in the first two Crystal Disk Mark tests. However, in a rather surprising outcome, it actually decreased the score in the 4K read/write benchmark. 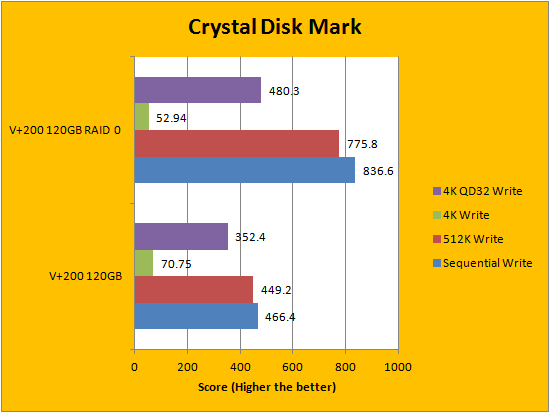 Closing off the set are the 4K QD32 results; RAID 0 significantly improved write performance, as you can see in our graphs above. 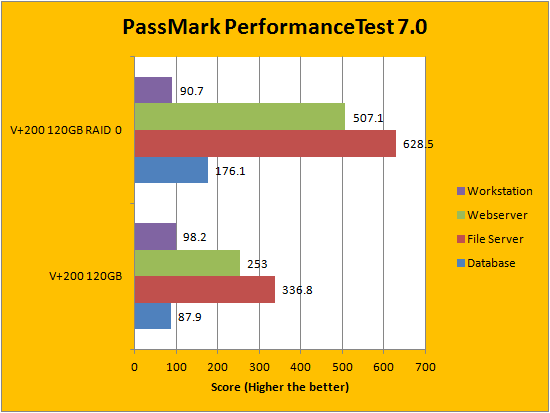 PassMark PerformanceTest 7.0's Advanced Disk Test is up. 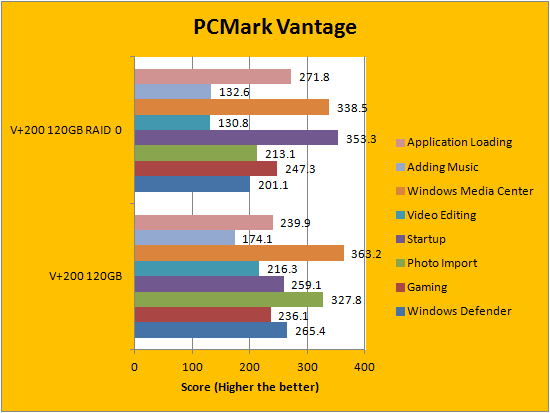 If you are familiar with our SSD reviews, you would know we normally post graphs generated by the program. However, for the purpose of quick referencing, I simplified it and just took the average -- the shape of the curve is not all too important here. 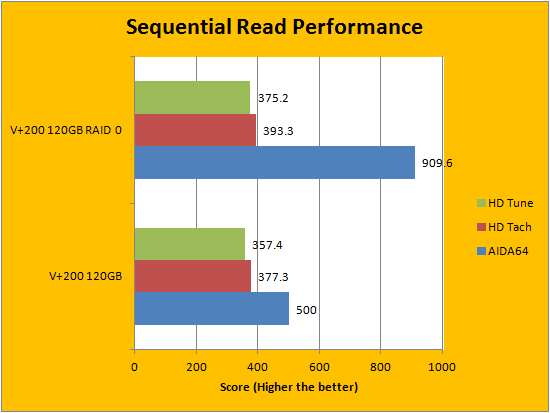 Other than the Workstation simulation, the rest of the three categories benefited significantly from the RAID 0 configuration -- with figures no single SSD can match on its own. This includes the venerable OCZ Vertex 3 Max IOPS 240GB. PCMark Vantage aims to shed a little more insight into real life performance of your computer hardware by semi-synthetic means -- and all insight is good, right? The great thing about standardized tests is anyone can repeat them and get very similar results, given identical hardware. Well, I am not going to narrate the stuff above in detail, because we all know graphs are there for a very good reason. As you can see in our graphs above, it is rather surprising that the Kingston SSDNow V+200 120GB's RAID 0 results are actually lower than it is compared to just having one disk. From what I have seen around the internet, I am not the only one getting these results, so hey -- what can you do. No benefit from RAID 0 here. The way I see it, if you already own a smaller SSD, and you can get a second one for cheap, RAID 0 is definitely a viable solution for boosting performance and increasing storage capacity. However, if you are starting from scratch right now, a single moderately sized SSD is already very speedy -- the risks associated with a RAID 0 setup probably do not justify the benefits for most people. And of course, if you have the money, do keep in mind larger solid state drives generally perform a bit better than smaller ones -- and will deliver more consistent performance with a much lower risk of failure. At the end of the day, there is no definite answer of whether you should RAID two SSDs or keep one only; there are pros and cons of each setup -- know what your priorities are, and what you should do should be very clear. Kingston provided these products to APH Networks to facilitate this report. Do you have any comments or questions about SSDs? Drop by our Forums. Registration is free, and it only takes a minute! posted 13 hours and 21 minutes ago, with 1 posts. posted 13 hours and 22 minutes ago, with 7 posts. posted 13 hours and 26 minutes ago, with 58 posts. posted 13 hours and 27 minutes ago, with 10 posts.